Jog around the grid changing direction and speed. Low skips around grid into high skips-- Side steps -- Jockey forwards and backwards -- Heel Flicks -- High Knees. 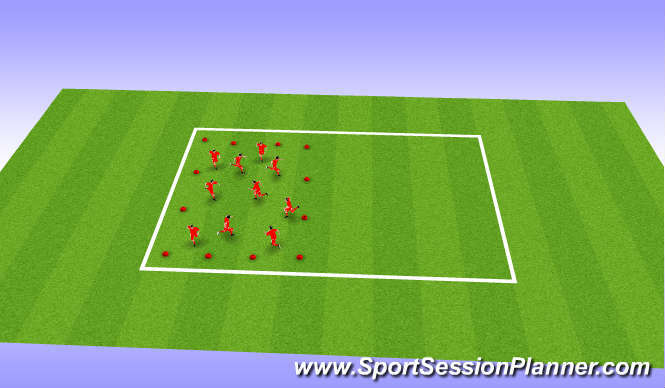 Dribble ball around the grid taking plenty of touches. Open & Close Gate --Lunges -- Side Lunges -- Squats. Carioca -- Kick Throughs -- Heel to Toes. Players jump 2 footed throughout over hurdle, jump over 2 right and back, jump forward again, 2 two the left and back and finally forward (3 times). This is then repeated but lateral steps instead of jumps (3times). 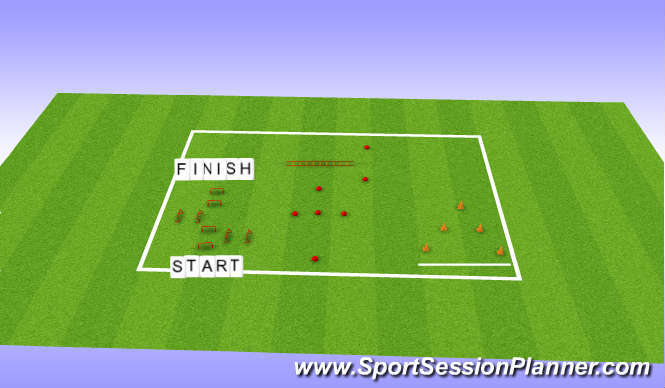 Players then repeat this for a final time but single legged (right and left 3 times).